Is Johnny 5 in the attic? A few weeks ago this furnace stopped blowing air. The tenant called the property manager to get it fixed. The home had a home warranty, so the property manager called the home warranty company. The home warranty company dispatched Borderline Heating & Air. 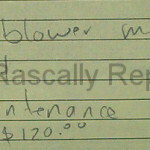 Their repairman suspected a bad blower, but he wasn’t sure. So what does a repairman do when he doesn’t know what he’s doing? He takes the suspect part to someone who does. So, unbeknownst to the property manager, the repairman removed the blower and took off with it. He says as much on his invoice. A few days later someone from Borderline informed the warranty company that the blower failed because the furnace was dirty. In other words, Borderline blamed the failure on a lack of maintenance – otherwise known as neglect. The home warranty doesn’t cover neglect. No coverage for you! After two weeks of hassling with Borderline, the property manager was fed up and sent me to the home to see what was going on. I found the blower missing, evidence that the blower was probably good, no evidence of a dirty furnace and a few other problems that Borderline didn’t mention at all. As you’ll see in the video below, those unreported problems were a cracked collector box, a bad switch and soot near one of the burners. The soot had nothing to do with the dirt that Borderline reported. They didn’t even mention the soot. Borderline finally returned the blower and I installed it. As you’ll see in the second video, none of what Borderline reported was true. The blower runs fine. The real problem all along was a ten dollar capacitor. The reported dirt doesn’t exist. And what they failed to report was probably another attempt at denying coverage. The cracked collector box and soot aren’t causing functional problems yet. Those problems wouldn’t have been noticed by the tenants for a long time – long enough, perhaps, for the home warranty to have run out. 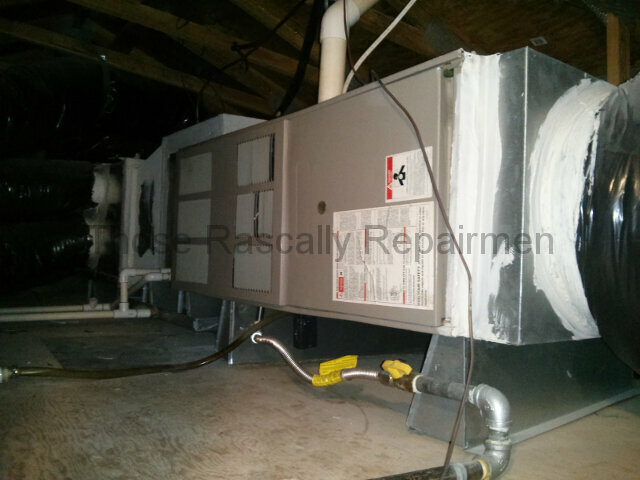 In short, the tenants went without heat for weeks because the home warranty company’s repairman couldn’t diagnose the single most common problem in the heating and air conditioning business. What he incorrectly diagnosed costs significantly more and was not going to be covered by the warranty for trumped up reasons. And what he failed to report were the most expensive repairs of all.